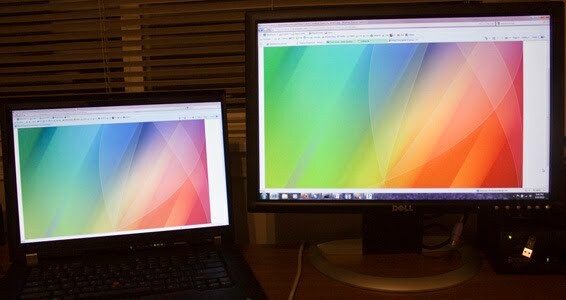 I suppose how much of a color difference you see in the two monitors above depends on your monitor's color profile, but for me, the standalone monitor comes across as having greener greens and redder reds. In fact, my laptop portrays this blog as a nice cool blue, whereas on my monitor it is a hideous shade of green. My intention is most certainly the blue variant, but I have no idea what other people are seeing. Anyways, this is really important for web design and photography. So, I am using this as an excuse to go buy a Dell U2410 IPS monitor and a Spyder3 color calibrator. That will ensure I am seeing what I am "supposed" to see, but presumably it remains a crapshoot for the remaining 99% of the world with uncalibrated monitors. They, no doubt, will take a look at this blog and see some unflattering and garish hue. Yuck.